Pasta’s Colour Game with multi-coloured Tutti Frutti! A few days back we were having Tutti Frutti Ice-cream in a nearby Ice-cream parlor. I found Pasta was super excited with tiny colored things than her portion of Ice-cream! I and hubby started playing a color game with her with the Ice-cream and she enjoyed that game a lot and even after returning home she was trying to recall colors! 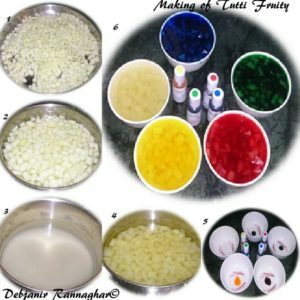 Use of Tutti Frutti is quite common in Indian desserts and cakes but I never thought of preparing those at home before. In fact, I had a weird idea about it that those are a by-product of Areca nuts as Red Tutti Frutti is often used in “Meetha Paan” (stuffed Betel leaf) and in Bengal those are known as “Misti Supari”! 😯 What a pathetic thought! 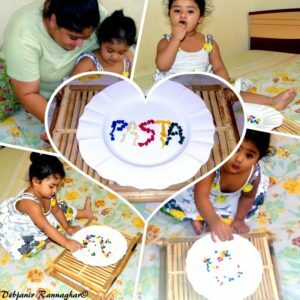 However, after observing Pasta’s excitement over the sweet and cute things, I started exploring the internet and what I found is hilarious! It is nothing but a by-product of raw Papaya or it is better to say Indian Tutti Frutti is Candied Papaya! 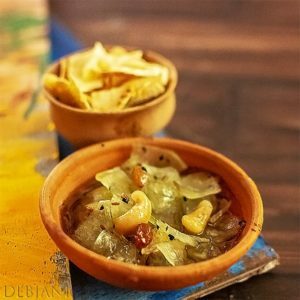 Recipe of Tutti Frutti that I found on the internet is really easy and can be prepared with minimal ingredients but is time-consuming! When I told Mehebub about my Tutti Frutti venture he didn’t even believe that candied papaya is made of Papaya and as usual was not confident about it 👿 . 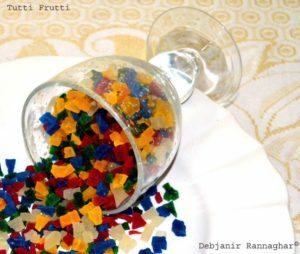 However, I have decided to prepare multi-colored Tutti Frutti for Pasta since I am not much willing to give her candied papaya available in the market as I am not confident on the colors used in market bought Tutti Frutti. 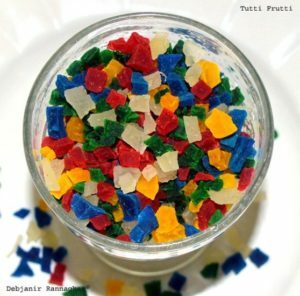 Pasta’s Colour Game with multi-colored Tutti Frutti! Wash Papaya thoroughly and peel Papaya Skin using a peeler. Cut Papaya into 4 equal halves. Remove Seed and also remove the soft white inner skin from the Papaya. Now cut Papaya into small cubes. Refer to the picture for the size of each Papaya Cube. From 500g Papaya I had around 2 Cup full of Papaya Cubes. Now take 5 cups of Water in a vessel and start boiling the water in medium flame. Blanch for around 3-5 minutes or till Papaya Cubes turns translucent. Switch the flame off and cover the vessel containing papaya and water with a lid and give it a stand for 5 minutes. Strain Cooked Papayas from water and discard the water. Take Sugar along with 2 cups of water in a vessel. Start boiling it in medium flame until sugar dissolves completely. Add Cooked Papayas in the Sugar Syrup. Cook till the syrup turns into one string consistency and then switch the flame off. Add Vanilla essence to the Papaya mix and give it a light mix. I've prepared 5 colored Tutti Fruitti. Now take 5 small bowls and 2-3 drops of food color in each bowl (Red, Green, Blue, and Orange). No color is required for White Tutti Fruitti. Now divide cooked Papayas along with Sugar Syrup into the bowls. Mix with spoons to coat Papaya Cubes with the color. Cover bowls with lid and leave those overnight to help Papaya cubes to absorb color. After 6-8 hours strain Candied Papayas from the Sugar Syrup. Spread those over wire net and dry those under open air. My Tutti Frutti took 1.5 days to dry completely. Completely dried Tutti Frutti won't stick together. Store dried Tutti Frutti in an Airtight container for future use. Candied Papaya can be used in Ice-cream, Cakes or in cookies or if you have a little child as me you can use those for playing the colour game with your little angel. I often make Tutti Frutti Cake (click for recipe) using candied papaya. « Shahi Paneer Korma as part of Saturday’s No Non-Veg Dinner!